There is a quaint fish market next to the Old Port in Mombasa. The decibels of oceanic waves slapping the shore rise with every step taken towards the landing site. Close by, fishermen huddle in small groups, exchanging banter as they wait to offload the day’s catch, hauled aboard small motorized boats. At the market, they will sell a kilo for KES300, a price that is often doubled once the fish gets to urban towns. Mustapha Swaleh, one of the fishermen in the group, has been earning his living from fishing for the last seven years. But he is not a happy man these days, because his catch is noticeably reducing with each foray into the ocean. Next to him is Mohamed Noor Mohamed, a fellow fisherman who has watched things take a turn for the worse over the thirty years he has eked a living out of the Indian Ocean. “We find a lot of plastic bottles in the ocean. They flow with the waters. Some fishermen complain about their fishing lines being caught in the trash,” says Mohammed. “What has really helped is the ban on plastic bags. There were a lot of them here. But as you can see the water is cleaner, except for the bottles,” he says. For Mohammed, there are good days and bad days. On the good days, they’re able to bring in a decent catch, enough to put food on the table and take care of other necessities. But there are days when they return empty-handed and have to directly bear the KES1,000 it costs in fuel for every outing. “We depend on the ocean. But a lot of the times we get nothing,” he says, giving a glimpse into the threat facing thousands of Kenya’s coastal fishermen whose only source of income is the increasingly polluted waters. According to the United Nations Environment Programme, over three billion people around the world depend on marine and coastal biodiversity for their livelihoods. That’s over a quarter of the world’s population. Marine fisheries directly or indirectly employ over 200 million people, while the market value of marine and coastal resources and industries is estimated at $3 trillion per year, or about 5 percent, of global GDP. But things are changing, and the amount of plastics washed out to sea is not only increasing; it is now the biggest single menace to fishermen and threat to a major protein source for almost half of the global population. Today, an estimated 80 percent of marine litter comes from land sources, with 60 to 80 percent of total marine debris being plastics. These plastics are carried by rain water or driven by wind, ending up in rivers, which empty into oceans, threatening marine life through ingestion, entanglement and intoxication. This inconvenience is a by-product of the alarming amount of plastic waste ending up in the oceans, which UN Environment estimates at 13 million tonnes each year. 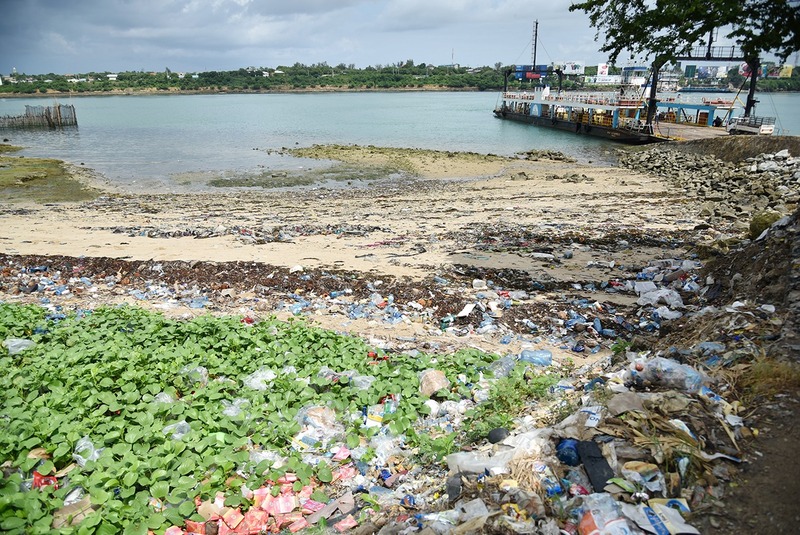 “People dump trash without knowledge that it will be taken as far as the ocean,” says Mombasa Marine Park Tourism Warden Julius Ngeti in explanation, hinting at the daily habits such as littering that need to be addressed. Plastic waste washed up on a beach in Mombasa. It’s not just the fishermen who are suffering. Marine Park warden Beatrice Jerop says that sea turtles have been killed by ingesting plastic debris. Jerop adds that pollution is also affecting beaches, which are turtles’ nesting areas and a habitat for a lot of small sea creatures. “When we remove the trash we are creating a safe space for the turtles to come and nest,” she says. According to Director of Coastal Oceans Research and Development – Indian Ocean (CORDIO) David Obura, the fight against marine plastic pollution cannot be won individually: everyone must join hands to beat the plastics threat. “Experts estimate that in 2050 there will be as much plastic in the ocean as fish if we don’t change how plastic waste ends up in the sea. It is everyone’s responsibility to do their part to minimize waste and pollution, not just pass the buck to someone else,” he says. In 2011, the amount of plastic waste found on the seabed was so alarming that something had to be done. On land, tourism operators had raised the alarm over the litter making its way to Kenya’s pristine beaches. The industry was staring at a potential crisis, as more and more waste was washed ashore and tourists complained of the eyesore they didn’t bargain for when paying for their holidays. “We border the Jomo Kenyatta public beach where almost everyone carelessly tosses bottles, wrappers and packets after snacking. This is the source of debris in our marine conservation area,” says Ngeti, the Mombasa Marine Park Tourism Warden. The answer to this problem came in the form of monthly clean-up exercises conducted by the Mombasa Marine Park, which have began to bear fruit. Data collected during the cleanup exercises found the number of plastic bags had dropped following last year’s ban on plastic bags, suggesting that plastic bottles have to be dealt with as much effort as the bags were. 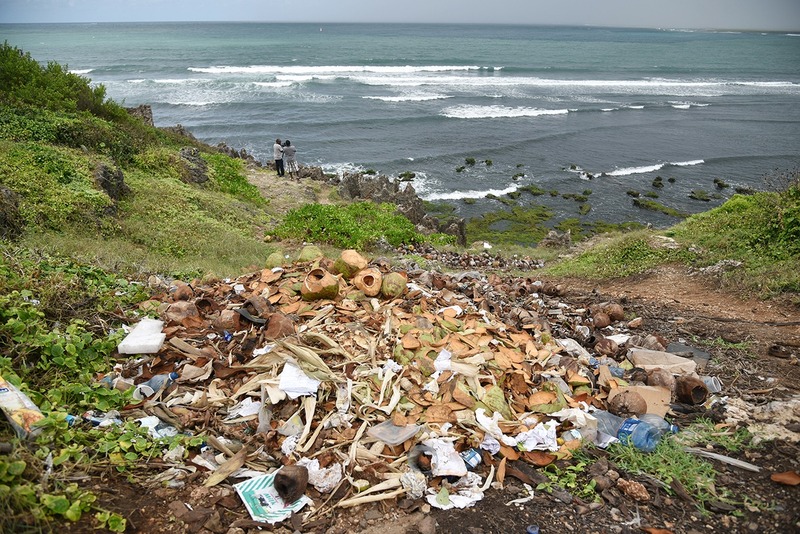 During the beach clean-up in May this year, 45 kilograms of plastic waste were collected, which was significantly lower compared to the same month last year when the total amounted to 101 kilograms. “Pollution from plastic bottles is now greater compared to other wastes. The amount of carrier bags we collect has reduced, apart from a few which are blown by the wind from the main road. We may not be able to eradicate plastics completely, but a ban on the major ones like bottles will go a long way to improving the health of the ocean,” he adds. 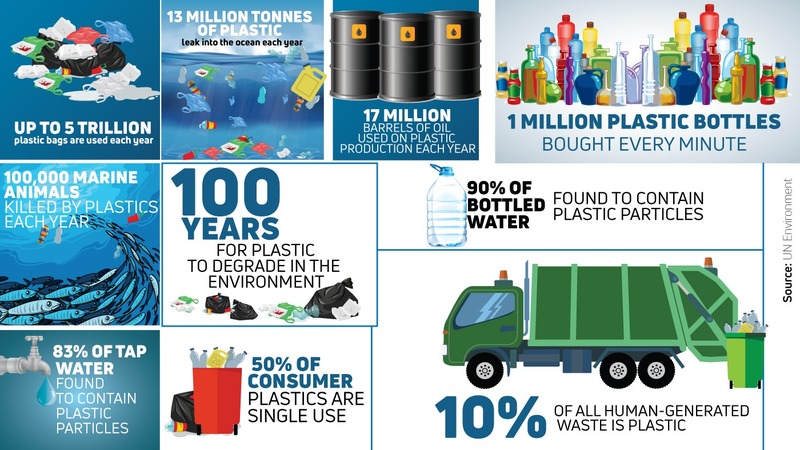 But are plastics the issue, or is it how we dispose of them? It’s a question that leads us to a wider conversation on the pros and cons of plastics, which Obura, the CORDIO Director, says requires a look at how we categorise and manage waste. Plastic bottles and other waste at Mama Ngina Drive. His recommendation: that waste be separated into key types, made as clean as possible, then taken to relevant disposal sites pre-sorted. “If this is done, a country like Kenya can turn around and effectively recycle waste, reducing environmental and health problems, creating jobs and businesses and building a more egalitarian society,” he emphasises. Just a few days after we had this conversation the world’s attention was turned to the threat posed by pollution from plastic waste courtesy of this year’s World Environment Day theme: #beatingbackplastics. According to a new report from UN Environment, there is a surging momentum in global efforts to address plastic pollution, but calls for more concerted and collaborative efforts to keep up the impetus need to be sustained. “The assessment shows that action can be painless and profitable—with huge gains for people and the planet that help avert the costly downstream costs of pollution,” said Erik Solheim, Head of UN Environment, in the report’s foreword. However, the report goes on to cite the fundamental need for broader co-operation from business and private sector stakeholders, offering a roadmap for upstream solutions, including extended producer responsibility and incentives for adoption of a more circular economy approach to plastic production and consumption. 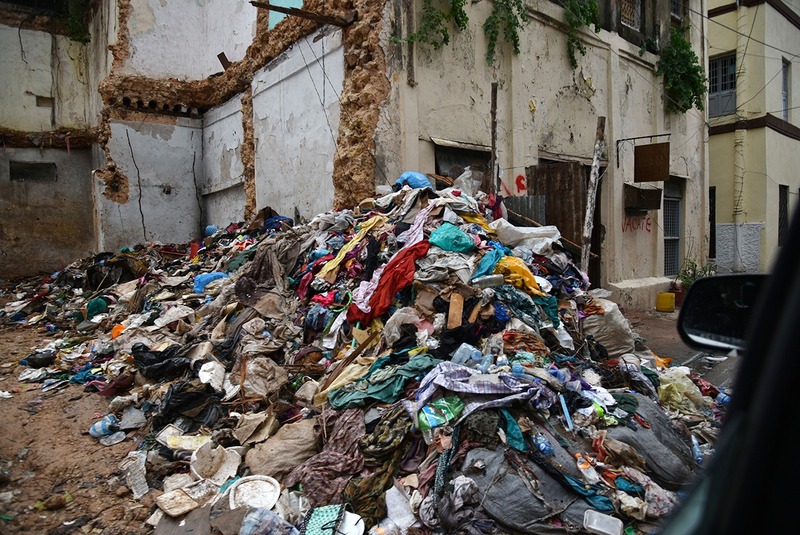 Garbage at Old Town Mombasa. In Kenya, calls to decrease plastic waste pollution resounded in the coastal county of Kwale on World Environment Day, where Deputy President William Ruto led calls to beat back plastic pollution as he pointed to the reality of waste being a threat to the environment, the economy and human health. “Kenya alone generates two million tonnes of plastic waste, with 90 percent going to the ocean,” he said at Kwale’s Baraza Park. It’s a reality that is not lost on Safaricom, Kenya’s largest mobile network operator. Last year, the company became the first to announce that it would no longer use plastic bags in its packaging, replacing them with reusable carrier bags just as the world prepared to mark the annual World Environment Day. The decision, which was expected to save the company about KES 10 million each year, was made in line with Safaricom’s commitment to the UN Sustainable Development Goal 12, which calls for an in-depth reflection on what is produced and consumed within the entirety of business operations, said Steve Okeyo, Director Regional Sales and Operation when making the announcement. Most recently, the company embarked on a new initiative, replacing plastic waste baskets with eco-friendly separation bins that encourage employees to sort out waste into three categories – food, paper and plastic – before dumping it. Through its Corporate Responsibility department, Safaricom is also pushing for the replacement of single use plastics in its cafeteria, encouraging employees to either bring their own reusable containers and cutlery when getting takeaways, or make use of the glass, metal and reusable plastic tableware provided by the food vendors. “The business of business is not just business anymore. Companies can, and should, play a more active role in preserving the environment. We can no longer be passive; we need to actively get involved. It starts with the smallest of actions,” notes Stephen Chege, Corporate Affairs Director – Safaricom in a recent opinion piece. It’s a commitment that points to the need for greater effort from individuals, institutions and governments, whose responsibility it is to ensure that our marine and terrestrial environments are well preserved for future generations. In the meantime, for Mustapha the fisherman, his colleagues and the rest of humanity, the video message by UN Secretary-General António Guterres on World Environment Day offers hope that maybe one day, we can turn the tide and restore our oceans to their former glory. “The message is simple: reject single-use plastic. Refuse what you can’t reuse. Together we can chart a path to a cleaner, greener world,” said Guterres.